This Koenigsegg Regera is oh so classy - if only it was real. After giving us a stunning purple design that would make Prince proud and a refined Regera inspired by French wine, Koenigsegg has continued its novelty design series inviting its employees to get creative and dream up their ideal Regera configuration to their personal taste. The results have proven interesting so far, reflecting the personalities and interests of the supercar maker’s staff. This week we get to see Art Director Lisa’s interpretation, which already gives you high expectations since rendering cars is essentially her job. 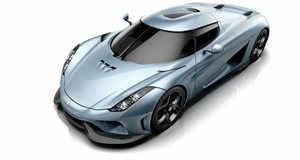 “This is familiar territory for her”, Koenigsegg explains, as “she spends a lot of time with our clients working on the spec of their own cars after they place their order.” All we can say is that Lisa has great taste: the resulting Regera render is one stylish black beauty that we would love to see in the flesh. Finished in Raven Black (that’s metallic with a hint of blue, she points out), Lisa describes her render as a “classy, modern, architectural vision of the Regera,” and it’s hard to disagree. Forged web wheels with calipers in Draco red compliment the exquisite exterior design, which has been fitted with a carbon center stripe on the hood, complemented with another carbon stripe down the side. The interior is equally classy, featuring luxurious Lingonberry leather seats with "weaved inserts and black French stitching,” and a black anodized center console. Lisa also seems to have an unhealthy obsession with interior carbon, but we're not complaining. Where can we place our order?